Editor/Author Davidson, Marilyn J. and Fielden, Sandra L.
Workplace initiatives to manage diversity seek to fully develop the potential of each employee and turn their unique skills into a business advantage. Such fostering of difference enhances team creativity, innovation and problem-solving and is therefore an essential strategy for today's employers. 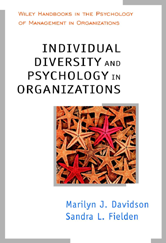 Individual Diversity and Psychology in Organizations is an indispensable handbook for all those involved in managing diversity. Its academic and practice-oriented perspective is unique as it presents practical strategies and case studies alongside academic reviews, giving the reader a balanced overview of each topic. The team of expert authors examine international issues in diversity, such as: - Strategies for managing organizational effectiveness Legal and psychological implications - Diversity training and its effectiveness Disability, racial equality, age and gender diversity Affirmative action - Recognizing stereotypes and bias - Business ethics - The Future of diversity This much needed handbook will be welcomed by researchers, academics and students in organizational psychology, management and business. It will also be of great use to professionals in human resources, equal opportunities management and management consultancy.